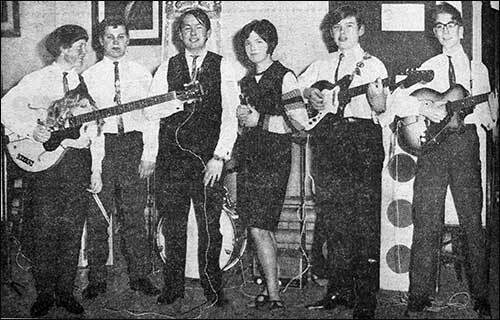 We have information about two local groups who played around the area in the 1960s. The Saphires & the Soundtracks. If you have information on any others, we'd be pleased to hear from you. 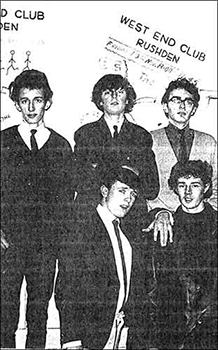 Did you go to the Teenbeat shows at the Royal Variety Theatre in 1960? Would you share your memories with us? Do you have any photographs of these events? THERE were no films at Rushden's Royal Theatre on Saturday afternoonbut the theatre wasn't deadin fact it had new-life . It was branching out with the presentation of the first live teenagers own Saturday afternoon showand manager Mr. Bryan Enoch thinks his is the first cinema in the country to put on such a show in the afternoon. 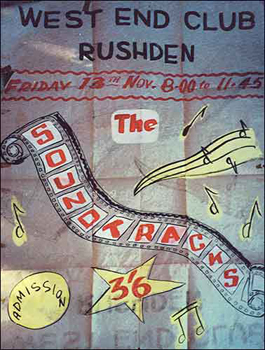 Rushden teenagers have long been asking for their own show. The Royal Junior Club catered for the children on Saturday mornings. And now Mr. Enoch has decided to let the teenagers have their fling in the afternoons. Just to be on the safe side he has had the stage extended so there is no fear of any energetic rhythm group going through his expensive screen. Special hi-fi equipment has also been installed. at the Royal Theatre on Saturdaywas more popular than the first held a week earlier. 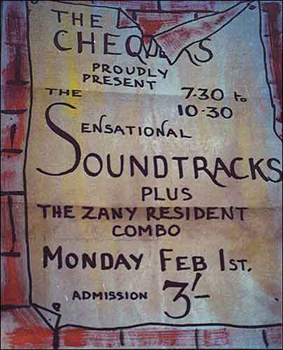 Queues started at 12.30 pm for the 2 pm start and the teenage audience was 250 more than the first "Teenbeat". The manager, Mr. Bryan Enoch said "Teenbeat" would probably develop into a regular show. After the show about fifty girls surrounded the players of the two local rock ’n roll bands to get autographsand one girl who had her arm autographed said she would never wash it again. The opinion of her parents is unknown. Tony Woodward  base guitar, John Hooton  double bass and Bruce Smith  drums. IN these days of the big band sound and Georgie Fame-type combos, you may not believe that good three-piece groupsall the rage of the fiftiesstill exist. But believe me they do and there is one right on the doorstep at Rushden. 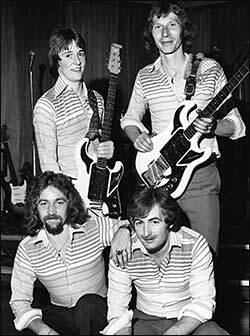 They are three modest and singularly unassuming ladsChris Frost (25), a solicitor's clerk who plays lead and rhythm guitar: John Keys (24), a machine tool fitter who plays bass guitar: and Bruce Smith (24), a packer who plays drums  called the Sapphires. The group started five years ago and it was one of the first three-piece line-ups around here, although it had a rocky beginning. Originally John played rhythm guitar and Chris stuck to lead, with Bruce on drums and another enthusiast on bass. 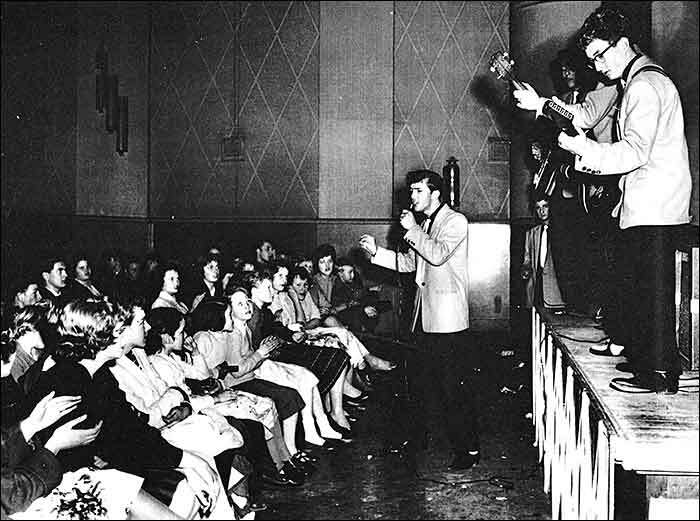 At this time Barry Noble, the swinging male model from Isham was singing for them. Then the bass player left and it looked as though the Sapphire sparkle had somewhat tarnished, never to shine again. 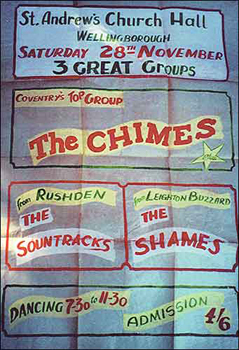 But Bruce and John had seen visiting London groups with only a three-piece line-up and they persuaded Chris and Barry they could make a go of it. John learned to play bass and with a reputation already established, they just carried on and they have never looked back. Life had its hitches, mind you. There was the time that Bruce fulfilled an ambition to turn professional and joined the Jimmy Justice backing group on a tour of Denmark, Sweden, Germany and Finland. They were a great success and scored a hit wherever they went. But coming back to this country it was quite a different story. While he was away the Beatles had released their first disc heralding the era of a different type of musiccompletely contrary to the Jimmy Justice sound. 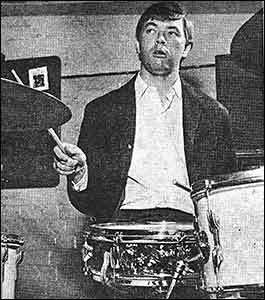 During the time that Bruce was away, dance band drummer Terry Mitchell filled in. But when he got a break to join a big dance band Bruce turned semi-pro again and rejoined the Sapphires. 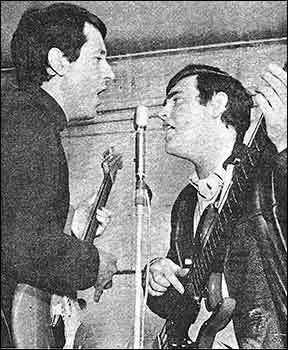 John, too, had itchy feet, and in September '64 he swopped places with the bass guitarist of The Worryin' Kind from Bedford. He did it in a week's holiday and that was enough. Back to the job meant back to the Sapphires. When Barry started modelling they were left high-and dry without a singer and although they still backed him at dance hall bookings, they began to play primarily for their own amusement. A couple of months ago Gidianthe singing Scot from Corby with one successful disc behind himapproached them and now when they do bookings, they back him. The group have no gimmick. They rarely play rousing top-tenners, but prefer to select their type of music from Lee Dorsey, Wilson Pickett, Otis Reading and James Brown albums. Occasionally, if one of these artists brings out a successful single which makes its presence felt on top ten territorylike Lee Dorsey's "Working in a coal-mine"they play it. But this is the exception rather than the rule. And what of the future? No demo-discs in sleek secluded studios for them. John and Bruce would both turn pro again, given the chance, but Chris scorns the idea. "It's not my idea of a job", he told me. "The market is too temperamental. I'm quite satisfied just carrying on as we do". But it would be a loss to the sophisticated school of music if the group split up. And it would be a great pity if three such complimentary personalities went to work. Ambition: To succeed in his job. Likes: Music, driving, good Chinese food. Favourite Group: Cliff Bennett & the Rebel Rousers, and Singer: Kenny Lynch. Likes: Sports cars, jazz, French food. Favourite Singers: Long John Baldry and Miles Davis. Likes: Girls with long hair, Indian food, Fish and Chips. Dislikes: Cruelty of any kind. Left - Chris (a solicitor's clerk) and John (machine tool fitter), above - Bruce in action. Paul Wright tells us "The lead singer was Noel Kehoe (Ebby), the drummer was Jake Ward, and one of the guitarists was John Cleaton. I was the drummer for various sixties groups & now present a '60's Sunday' radio show on 102.3 HFM." 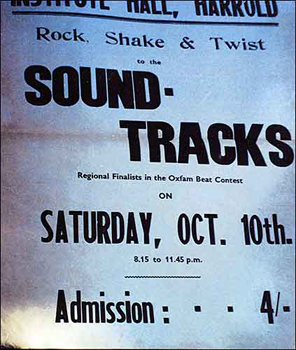 In 1964 the Windmill Club held the "Beat Group" Championships Tri-final on October 5th. Adrian Short on bass guitar, Pete May on rhythm guitar and Paul Wright on drums. at a recent function organised by Rushden Round Table. Already they are making a name as Pat and the Four and One, and are having a hectic time fulfilling all their engagements. 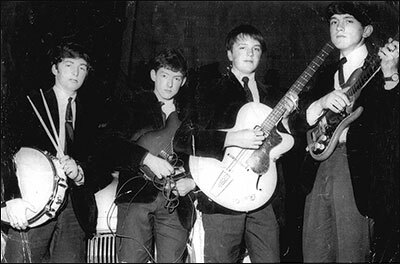 Left to right are: Robin Muddiman (bass), Paul Mundy (drums), Dave Potter and Pat Buckley (vocalists), Michael Bugby (rhythm) and Clive Abblet (lead). 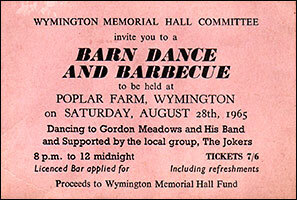 The local group supporting Gordon Meadows and his dance band at a Barn Dance at Poplar Farm, Wymington in 1965 for the Memorial Hall Fund. 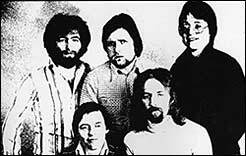 left: Rushden group Voodoo taken in the 1970's, were originally from Orlingbury. The members were Mark Norton on lead guitar, Andy Robinson on rhythm guitar, Pete Ainge on bass, and Paul Wright on drums. At the 'Sunnyside' in Northampton. In the 1980's Voodoo regularly entertained at packed venues around Northamptonshire and Leicestershire. 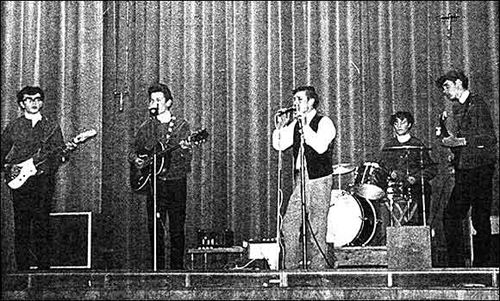 Above right: Ebby Kehoe on lead vocals (middle back), Andy Robinson on guitar (back right), Dave Hulett on guitar (left front), Pete Ainge on bass (right front), and Paul Wright on drums (left back). Sometimes played at the Viking.